I am the type of person that eats something once and enjoys it so much that I’ll keep making it and eating it over and over again until I’m just plain tired of it. This would happen more often than it does only because I have to test recipes and post new and inspiring food on my blog and social media regularly. But if I’m being honest, I would otherwise repeat what I eat A LOT! Which brings me to this shrub recipe. I know I posted a blackberry shrub recipe earlier this summer, but I cannot stop drinking them. 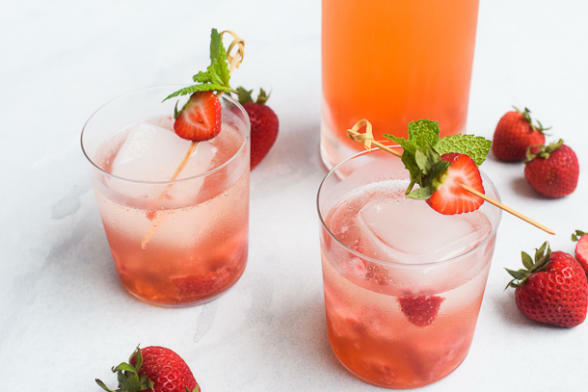 So I created this strawberry-ginger shrub for The Chalkboard Mag and I just had to give it a permanent home on my site! It has become my go-to drink this summer. I am not much for alcoholic drinks, other than once in a while. I don’t drink soda ever (as in I haven’t had a soda in over 20 years.) Otherwise I just drink water and tea and a morning tonic (which is mainly a boosted matcha, yerba mate or cacao drink.) 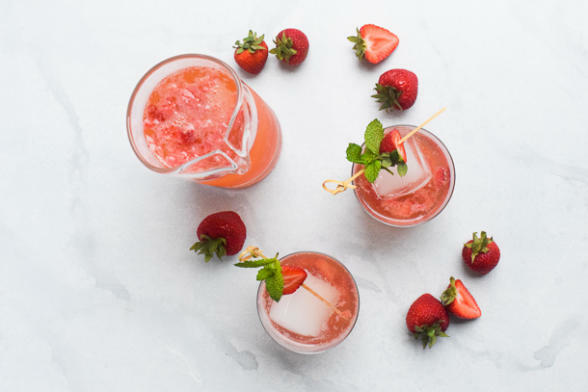 When I have friends over or in the summer when I have more time, I’ll usually make a fun drink like an agua fresca or the honey-ginger lemonade from my cookbook. Barely sweet, hydrating, natural drinks are my jam. If you remember, a shrub is a fresh fruit ade with vinegar (I use raw apple cider vinegar and enjoy all the probiotics to go with it.) It sounds like it would be weird, but I swear it’s so refreshing and delicious. There’s plenty of summer left to enjoy. And if you live in Southern California like I do, the heat is only just beginning! Treat yourself to this delightful shrub and both your tastebuds and your gut will thank you! If you make any of my recipes, I would love to see your creations! Please tag me on Instagram @pamelasalzman #pamelasalzman so I can check them out! To make the syrup: In a medium bowl, mash the strawberries with the ginger and maple syrup, using a fork. Let sit for 15 minutes to allow the mixture to get juicy. Stir in the vinegar. Cover and chill for 3 to 5 days, to allow for the flavors to meld. Transfer syrup into a jar. Can be stored in the fridge for up to 1 month. 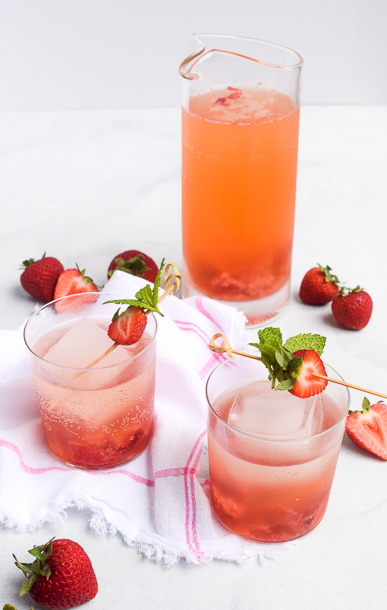 To assemble to shrub: for each serving, add 1oz shrub syrup to 5oz of sparkling water or alcohol. Add ice, if desired. Do you strain the syrup after letting it sit for 3 days? I don’t, but you can if you want to. Cover and chill for 3 to 5 days, in refrigerator? OOPS! How much maple syrup in the strawberry-ginger shrub? All I go was ” 1/4″, but no cup, or Tbsp, etc. Thanks. Oh man, thanks for catching that! It’s 1/4 cup. Fixing that now!